These gorgeous looking mango muffins with crunchy walnuts are to die for. 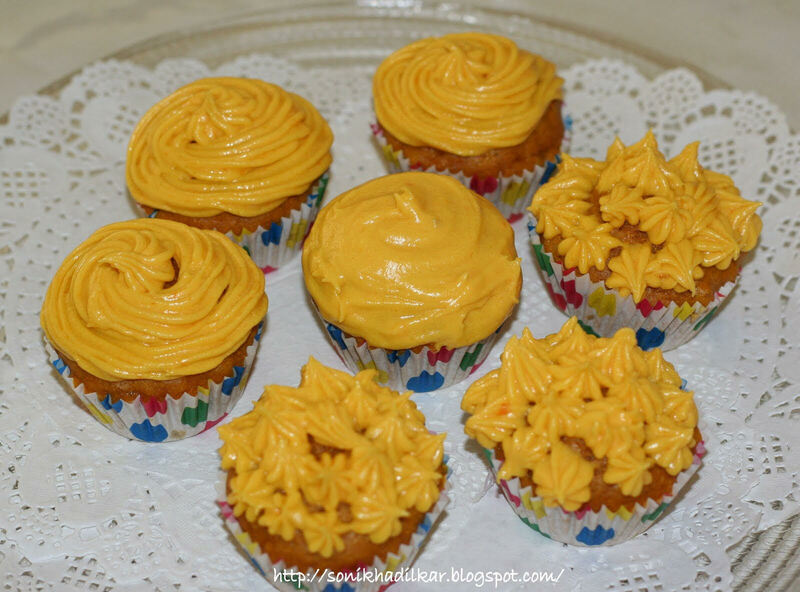 The mango frosting adds extra richness and creamy taste for this mango dessert. To make it bright orange I add mango pulp to the batter. You can try different variations like adding mango pieces instead of the pulp. I am sure they will be delicious & full of flavour. In a medium-sized bowl beat eggs until light and fluffy, combine the mango puree, melted butter, and vanilla with spatula. In another large bowl combine the wheat flour, sugar, baking powder, baking soda and salt. Now lightly pour the wet ingredients into the dry ingredients until they are combined and the batter is thick and chunky. (Do not to over-mix the batter. Over mixing the batter will yield tough, rubbery muffin.) Add milk as required if the batter becomes too thick. Spoon the batter into the prepared muffin liners. Bake for about 25 minutes or until a toothpick inserted comes out clean. Yields- 20 medium sized muffins. ← Holidays Are Here – Now What?